iStage Mini is Bluetooth V4.0 speaker and stand main for all kinds of Smart-phone (different brand and different size). As Bluetooth speaker, iStage Mini has two speaker drivers for high frequency and four passive radiates to boost bass, RMS 2Wx2. As a stand, it can fit all size Smart-phone even iPhone 6 plus. And, the angle is adjustable to fit all your watching angle. Particularly, you can hang iStage Mini on your neck when you gym, climb mountain, go hiking or play mobile game. There is NO volume controller on the speaker, you can control volume via Smartphone or other Bluetooth devices. STAND FOR SMARTPHONE: X9s Bluetooth speakers can fit all kinds of smart-phone, different brand and different size even iPhone 6 plus. Watching angle is adjustable to fit your watching habits. 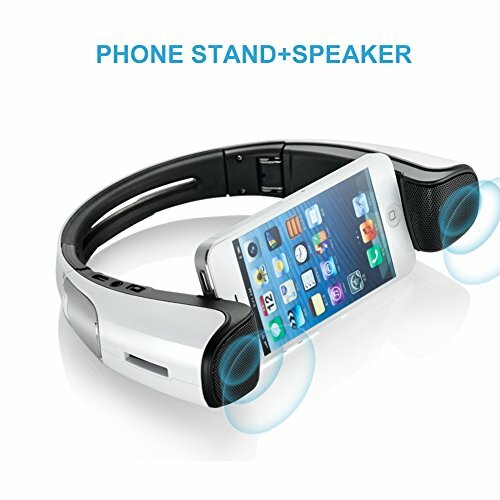 CAN BE USE AS SPORT SPEAKER: unique function, X9s speakers can hang on your neck when you go outside for sports such as walking, ride bicycle, climb mountain etc. FRIENDLY USE: It is foldable, easily slip into your backpack, taking your good voice anytime anywhere. Hang it on your neck when you gym, hiking, playgame, it is really cool and fashion. AFTER SALES SERVICE: One-month money back guarantee for non-artificial damages; Twelve-month warranty for any problem.